Ray Rice Wears New O's Cap. WOOOOOO. 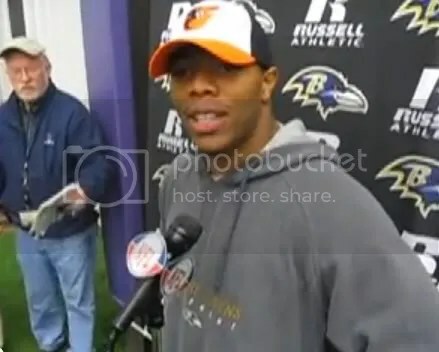 I suppose as a Ravens/Orioles blogger, Ray Rice sporting the stylish new O’s cap at The Castle today should be a perfect opportunity for some crossover posting action. Sorry, but I just can’t get too excited about this. Yeah, it’s cool that Ray is wearing the O’s cap and showing his support for Baltimore, and it’s awesome that he says he wants to throw out the first pitch at a game at Camden Yards this year. Still, just like I didn’t feel inspired to do a separate post on the O’s unveiling their new unis (I love them, by the way – but you can put lipstick on a pig and it’s still a pig), Rice wearing O’s gear and talking about baseball just isn’t getting me all fired up today. An while it obviously beats seeing Ravens players in say, Yankees caps, what we SHOULD be excited about as we sit here on November 16 is the Ravens sitting at 8-1, two full games up in the AFC, and with two very winnable home games in the next eight days. Instead, because the team has shat the bed twice against cupcake opponents in Jacksonville and, most recently Seattle, we’re all very timid and unsure about just what kind of football team we have on our hands. A team that’s capable of running the table and still securing home field advantage in the AFC? Or a team that will be more like the 2004 Ravens, who collapsed down the stretch after a 7-3 start only to finish 9-7 and miss the playoffs? With their relatively easy (on paper) schedule, I’d like to think that last scenario is outside the realm of reasonable possibility. But with the way they’ve conducted themselves against inferior competition here in 2011, how can anybody truly be confident that they’ll take care of the likes of the Colts, Browns, and suddenly very pedestrian Chargers? I’m sorry to be Debbie Downer here, I really am. I’m just still extremely annoyed and frustrated with the Ravens at the moment for blowing a golden opportunity to give themselves some breathing room. The “what ifs” surrounding this team are enough to drive a purple fanatic to true Raven maniac status. Here’s the video of Rice in the O’s hat, c/o WNST. Enjoy. I’m gonna go sulk some more. This entry was posted on November 16, 2011 at 5:53 pm and is filed under Ravens. You can follow any responses to this entry through the RSS 2.0 feed. You can skip to the end and leave a response. Pinging is currently not allowed.